Learn the basic tools and equipment use by technician. It’s also one of the question by the assessors during NC2 exam. And study what I mention below. I let you to understand this, do it hardly in exploring and studying. No matter what life we have, all sources of income is surrounded us.Just study and do not underestimate the exam. maybe it’s simple to others but very time consuming and do not bothered your self with this. The idea is make your self hardship and become an expert. This is only a pointers for your exam in NC2. What I learned and experience in my technical years of my profession and teaching. And the other side a biomedical technician. All the critical aspects of the exam are performed during training. So what would be taught by your instructors just follow and strive hard, it's a very boastful to our selves if we past the exam through our efforts and learning. And do not forget to ask our creators to provide us of what we need in our lives. There are four core competencies of technicians or CHS. 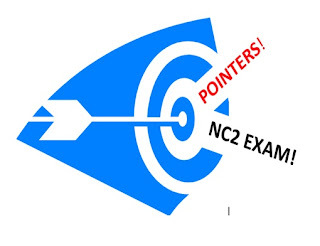 That is called full qualifications as NC2 passers, I was posted it here in my blog. Learn the safety precautions and 5’s of the technicians. Learn the basic electronics, you need to understand the electronic components. Study and familiarized very carefully the hardware of computer.Both input and out system,such as to familiarize and memorize the parts of the keyboard and different keys. Learn and understand the MOBO parts and functions and daughter boards.Not by the book alone but use our visual inspection of what you see is what you learn as a technician.The most applicable is memorize it. Learn and do the best installation of the hardware.Be sure to apply zero insertion force and familiarize or aware the pin 1 orientation.Or what I called red to red inspections. Be careful or learn strictly the procedures of the installation of the Operating System. The installation of winXP and windows 98 in dual boot.But be aware, learn also the installation of the new OS. Be sure yourselves in basic trouble shooting of computer,ex: the procedure on how to troubleshoot a power light is on nothing happens and nothing on screen. And be aware of using the control panel and the device manager. As what I learn this day, there are other additional part of the exam such as the configuration of the router. But to sure of this just study also the Metropolitan Area Network (MAN) most specially the connection and remote addressing. It’s very ok if you have learning of the CISCO installation. Just leave your questions in comment bar below. GodBless to all and goodluck to the exam.